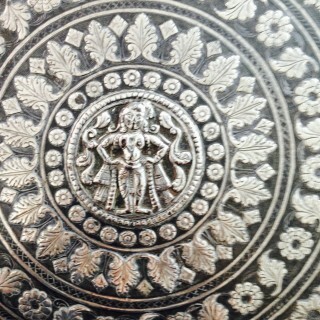 A Large fine antique Indian Bidriware silver inlaid Charger inlaid with stylised floral panels. This Charger is finely made and believed to originate from Bidar Karnataka, South West India and the manufacture dates back to the 14th century. 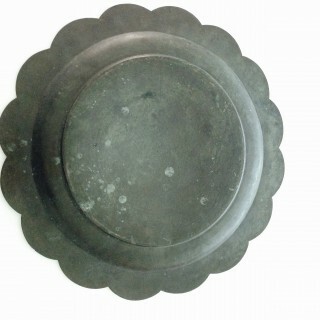 The process combines copper and zinc alloy finely decorated with a silver inlay. 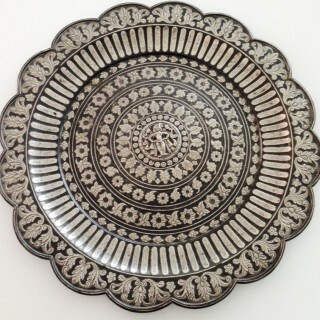 Due to its striking inlay artwork, Bidriware has been an important export handicraft of India and is prized as a symbol of wealth.